Larry Kwong made hockey history in a minute. In one game, one shift, one minute on the ice with the New York Rangers on March 13, 1948, Kwong became the first person of color, the first player of Asian heritage, to skate in the National Hockey League. That game was the sum of Kwong’s NHL career, but he left a lasting legacy on the game as seen by the number of minorities in hockey – on the ice, in the owner’s suite, behind the bench, and behind the mic – today. Larry Kwong, center, only played one minute in the National Hockey League with the New York Rangers but he helped pave the way for other players of color (Photo/Courtesy Chad Soon). Kwong passed away on March 15 in Calgary, Alberta, Canada, at the age of 94, two days after the 70th anniversary of his NHL debut. “The man was just the biggest gentleman you’ll ever meet, so humble but so accomplished from the standpoint of hockey,” said Brad Kwong, no relation, a managing partner of the Dubuque Fighting Saints of the United States Hockey League. Kwong was born in Vernon, British Columbia in 1923, the 14th of 15 children. The son of a grocery store owner, he was lured to hockey by Foster Hewitt’s play-by-play accounts of games on “Hockey Night in Canada” radio broadcasts. He begged his parents for a pair of skates and eventually got a $19 pair of oversized CCM’s. At 5-foot-6, Kwong developed into a speedy skater and a shifty center. He joined the Trail Smoke Eaters in 1941-42 after a successful midget hockey career. During World War II, he joined the Canadian army and mesmerized troops with his hockey skills. His play also caught the attention of the Rangers. The team offered him a tryout in 1946. The audition earned Kwong a spot on the New York Rovers, the Rangers’ farm team in the old Eastern Hockey League. Kwong became a scoring threat and a Rovers fan favorite, tallying 52 goals and 71 assists in 112 games. His minor league performance, and a rash of injures on the Rangers, prompted the a promotion to the parent club. Wearing Rangers red, white and blue, Kwong faced the Montreal Canadiens on March 13, 1948. Kwong sat through the first two periods, waiting Rangers Head Coach Frank Boucher to put him in the game. He got his chance near the end of the third period with the game tied at two. “They got me out there and I did the best I could,” Kwong told me in 2015 for an article in “Legends,” the official program guide for the Hockey Hall of Fame. Kwong was one minute and done for the game and the NHL. He never asked the Rangers why he didn’t get a longer look. Larry Kwong isn’t in the Hockey Hall of Fame, but a jersey he wore when he played for the Nanaimo Clippers in 1942-43 is in the hockey shrine (Photo/Courtesy Chad Soon). Brad Kwong, whose family knew Larry Kwong, figures that the late player never asked why because he seldom dwelled on the negative. Larry Kwong quit the Rangers after the 1947-48 season and joined the Valleyfield Braves of the Quebec Senior Hockey League. He notched 164 goals and 220 assists in 347 QSHL regular season games from 1948-49 to 1952-53 and was named the league’s most valuable player in 1951. Kwong tallied another 51 goals and 61 assists in 147 games with the Braves from from 1953-54 to 1955-56 when the team was in the Quebec Hockey League. Kwong ended his North American playing career in 1956-57, a season before forward Willie O’Ree became the NHL’s first black player when he joined the Boston Bruins. Kwong left the game in 1960-61 after playing for the Nottingham Panthers in England and HC Ambri-Piotta in Switzerland. He also coached in Switzerland for Ambri-Piotta and HC Lugano. While O’Ree has been hailed as the “Jackie Robinson” of hockey, Soon and others feel that Kwong hasn’t been given sufficient due for his accomplishments in the game. One of Kwong’s jerseys is on display at the Hockey Hall of Fame, but Brad Kwong believes that “King Kwong” should be in the hockey shrine in Toronto. Former Mighty Ducks of Anaheim star forward Paul Karyia, a Canadian of Japanese descent, is currently the only player of Asian heritage in the Hall, inducted in November 2017. “I look at what the Hockey Hall of Fame stands for and what it tries to honor and I think (Larry Kwong) has accomplished something that very few have,” Brad Kwong told me. Larry Kwong, a Chinese-Canadian player who many believe was the first person of color to reach the National Hockey League, isn’t in the Hockey Hall of Fame. But his hockey jersey will be. Larry Kwong with jersey sent to Hockey Hall of Fame. The Hall recently received a well-preserved 1942-43 Nanaimo Clippers jersey from Kwong, a diminutive scoring dynamo who made hockey history when he skated a single one-minute shift for the New York Rangers against the Montreal Canadiens during the 1947-48 season. He accomplished the feat 10 years before forward Willie O’Ree joined the Boston Bruins and became the NHL’s first black player, skating against the Habs, and seven years before Chicago Blackhawks forward Fred Sasaskamoose became the league’s first Native/First Nations player, breaking the barrier against the Toronto Maple Leafs. Kwong, in strong voice at 90 years old, told me recently that it feels “wonderful” knowing that the jersey from his senior amateur team will hang in the Hall in Toronto and hopes that it will inspire more Chinese kids to lace up the skates, take up the game, and aim for the NHL. As thrilled as Kwong is of having a piece of his hockey legacy in the Hall, the Hall is overjoyed to have an artifact from Kwong’s lengthy playing and coaching career. Kwong’s NHL moment was brief, but the British Columbia native cherishes it as a high point of his playing career. Kwong back in the day with Nanaimo Clippers. The journey of Kwong’s jersey to the Hall of Fame was aided by a 10-year-old boy’s curiosity. Quinn Soon was working on a heritage fair project on the late Herb Carnegie, a black Canadian regarded as one of the best hockey players never to reach the NHL because of his skin color. Quinn interviewed Carnegie’s daughter, Bernice, and Kwong, who played against Carnegie in the Quebec League, for the project. Quinn remembered unsuccessful attempts to get Carnegie inducted into the Hall of Fame and wondered whether the shrine could make a display to showcase items from Carnegie – and Kwong. Bernice Carnegie says she’s still talking with Hall officials about her father’s artifacts. She believes having items from Kwong, her dad, and other players of color in the Hall is important in order for hockey to visually tell an under-told story. These days, Kwong is enjoying accolades. Powered by efforts by Chad Soon and some of his students, Kwong was inducted last September into the British Columbia Sports Hall of Fame. And his jersey adds to the Hockey Hall of Fame’s collection of minority hockey artifacts – memorabilia that includes a game-used O’Ree stick from the 1960-61 season; Hall of Fame goaltender Grant Fuhr’s equipment from his stints with the Edmonton Oilers, Buffalo Sabres and St. Louis Blues; and a stick and Washington Capitals jersey from Reggie Savage, a black player who was the first NHL player to score on a penalty shot in his first game. The Hall would love to have more, Pritchard said. Brad Kwong has gone from the Ivy League to corn country for the love of hockey, adding to the game’s rich Asian history along the way. Kwong, a defenseman who captained Harvard University’s hockey team in 1984-85, is part of the group that owns the Dubuque Fighting Saints of the United States Hockey League, the top junior league in the country. When Northern Lights, LLC purchased the team in 2009, Kwong became part of a growing number of people of color – many of them Asian – in hockey’s ownership ranks, from the junior leagues to the National Hockey League. Brad Kwong, center, congratulates on of his team’s players (Photo/Dubuque Fighting Saints). Harvard crimson and business ties run deep through the Fighting Saints ownership: Kwong, Phillip Falcone, Northern Lights’s principal owner and part owner of the NHL’s Minnesota Wild, and Peter Chiarelli, general manager of the Boston Bruins, played hockey together at Harvard in the 1980s. Mark Falcone, another Northern Lights managing partner and a Minnesota Wild board member, played hockey for the University of Denver hockey player. Phillip Falcone is chief investment officer of Harbinger Capital Partners, a Wall Street private hedge fund, and Kwong is a managing partner in the firm. The 50-year-old Kwong may have good partners assisting him in the hockey business, but he also learned a lesson or two from his dad. Norman “Normie” Kwong was a star running back Canadian Football League’s Calgary Stampeders and the Edmonton Eskimos in the 1940s, 50s and 60s. But he was also part of the ownership group that bought the NHL’s Atlanta Flames and moved the team to Calgary in 1980. When the Flames won the Stanley Cup in 1989, the elder Kwong became one of the few people whose names are etched on both the CFL’s Grey Cup and the Stanley Cup. 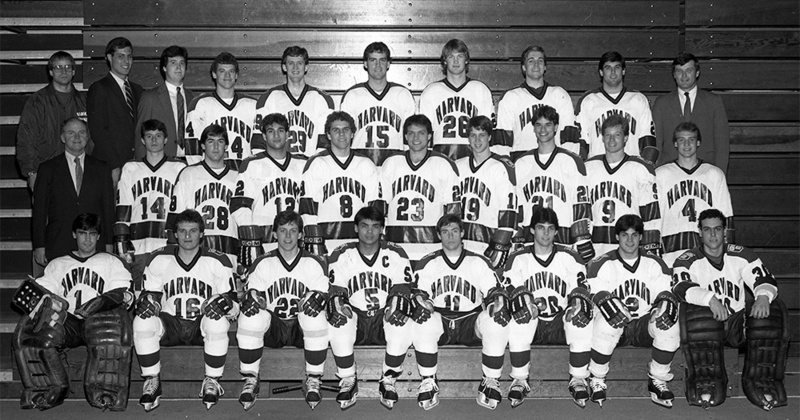 Kwong, front row, center, was captain of Harvard’s 1984-85 hockey team (Photo/Harvard University). Brad and Norman Kwong aren’t the only family members with hockey ties. Graham Lee, Brad Kwong’s cousin, is owner and governor of the Victoria Royals of the Western Hockey League. Lee’s company, RG Properties, built and operates the 7,000-seat Save-On-Foods Memorial Centre, the arena where the Royals play. Lee and the Kwongs are part of a history of Asian ownership in hockey. The Tampa Bay Lightning began its NHL life under a Japanese ownership group. Shanghai-born and New York-raised Charles Wang, owns the New York Islanders, an NHL franchise that’s currently up for sale. Chicago-based businessman Horn Chen is a minority owner of the NHL’s Columbus Blue Jackets. The media-shy Chen once told The Chicago Sun-Times that he became interested in hockey when his son played in a youth tournament in Indianapolis. That interest launched Chen on a team-buying binge: He founded the Central Hockey League and owned the CHL’s Wichita Thunder, Topeka Tarantulas, Oklahoma City Blazers and Mississippi RiverKings. He also owned the International Hockey League’s Indianapolis Ice, the East Coast Hockey League’s Columbus Chill, the CFL’s Ottawa Rough Riders (briefly) and several minor league football, baseball, and basketball teams. 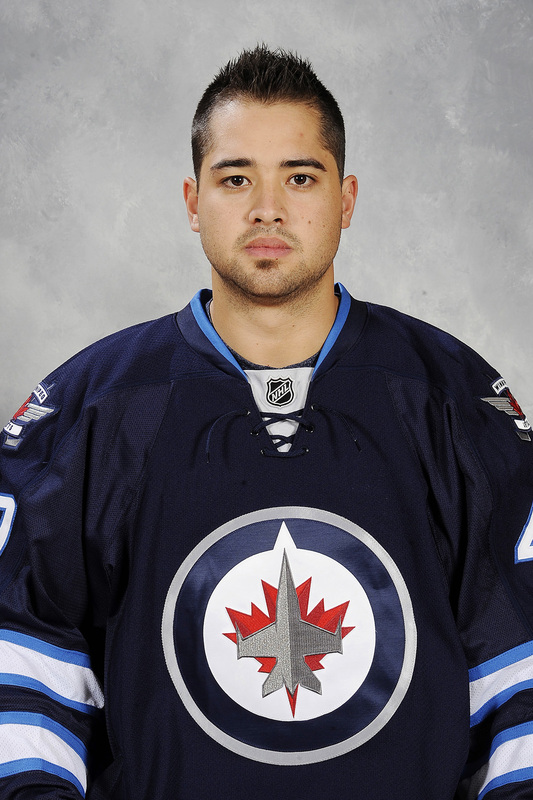 Winnipeg Jets forward Devin Setoguchi. Asian-American and Asian-Canadians have had an impact on the ice as well. Forward Paul Kayria, who’s of Japanese descent, was the first hockey player of Asian descent to captain an NHL team when he was awarded the “C’ by the Mighty Ducks of Anaheim. Defenseman Jim Paek, who’s of Korean heritage,won two Stanley Cups with the Pittsburgh Penguins in the 1990s. Seoul-born right wing Richard Park enjoyed a long NHL career with the Pittsburgh Penguins, Minnesota Wild, Philadelphia Flyers, Vancouver Canucks and the Islanders. Asian players currently in the NHL include Winnipeg Jets forward Devin Setoguchi, who’s Japanese-Canadian, and Carolina Hurricanes forward Manny Malhotra, who’s Indo-Canadian. Hockey has come a long way since Larry Kwong became the first Chinese-Canadian – and some historians argue the first person of color – to play in the NHL when he skated a single one-minute shift for the New York Rangers in a game against the Montreal Canadiens at the Montreal Forum during the 1947-48 season. A decade later, in 1958, Willie O’Ree became the NHL’s first black player when he skated for the Bruins, ironically, against the Canadiens. Hockey has come a long way from the days when Larry Kwong, center, played (Photo/Chad Soon). Larry Kwong, who was inducted into the British Columbia Sports Hall of Fame last September at age 90, isn’t related to Brad Kwong, the two men share a sort of six degrees of separation that causes Brad to chuckle when recalling an episode that happened while he was playing professional hockey in Europe post-Harvard undergrad. Brad Kwong believes he’ll have company in the owner’s club in the not-too-distant future as minority players currently in professional hockey get older and transition into the next phase of their careers.